WinWedge captures serial data, custom tailors it to meet your needs, then transfers it to any Windows application - either by sending keystrokes to the application's window or by passing the data through Dynamic Data Exchange (DDE) conversations. WinWedge also transmits prompts or commands through the serials port to control or query your Mark-10 or other instruments from within other Windows applications or directly from WinWedge. Think of WinWedge as a fully customizable serial I/O device driver that will save time while eliminating data entry errors. The WinWedge 32 Pro is a true 32-bit version with advanced parsing, filtering and formating of text, binary, hex, octal and ASCII data. Expanded DDE support allows other applications to completely control WinWedge and all serial I/O. This lets you create extremely powerful data acquisition and device control interfaces from within any Windows application that supports DDE (including Excel, Access, MMIs and LIMS). It also supports TCP/IP communications and is 30% faster. 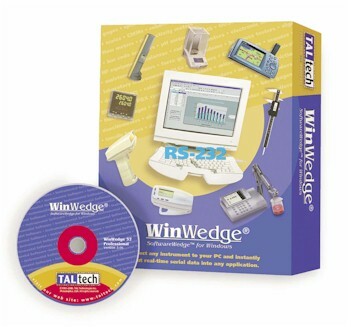 Two additional programs - TCPWedge and FileWedge are included free with the WinWedge 32 Pro. Supports all COM ports 1-9. Install on up to nine serial ports on a PC for data collection from many devices simultaneously. Data Transfer as Keystrokes directly into any other application program. Data Transfer by DDE to any Windows application. Includes an advanced set of DDE commands that allow other Windows applications to take complete control of all Wedge functions, including serial output functions. The DDE command set allows you to create extremely powerful device control interfaces from within any other program that supports DDE, e.g. Excel, Access, etc. Basic Data Parsing Capabilities allow you to split incoming data into fields. Input only data you need and ignore the rest. A Powerful Serial Data Analyzer feature allows you to preview serial data and debug all serial communications problems. Data Filtering Capabilities let you selectively filter out non-numeric characters from any field in your input data or ignore specific fields altogether. The Pro versions have additional filtering options. Pre-Transfer Translation Tables. Translate incoming ASCII characters to other characters to specific PC keystrokes. Keystroke Macro Insertion. Add additional keystrokes or keystroke macros before, after, or within your serial input data. Keystroke macros allow you to control where and how serial data appears in the target application program in Keystroke Mode. Automatic Date and Time Stamping. Place date and time stamps directly in your serial input data. Up To 20 Button Controlled Output Strings. Program buttons to either send data strings out the serial port or lower the PC's DTR line whenever the button is clicked. Use the Output Buttons to send prompt strings, or other control data, to your serial devices. Automatic Data Acknowledgment feature sends a string back to the serial device after each data record has been received. Timed Automatic Prompting. Have the Wedge automatically transmit prompt strings or commands at regular timed intervals. Fully Selectable Communications Parameters. 110-19,200 baud; 5,6,7 or 8 data bits; 1 or 2 stop bits; EVEN, ODD, MARK, SPACE or NO parity. Hardware and Software Flow Control. Selectable input and output buffer sizes from 128 bytes to 32K. Support for new high speed 16550 UARTs and all available IRQs. TCP-Wedge FREE. Adds TCP/IP Support: Collect data from IP port addresses on any TCP/IP network - ethernet/Internet. TCP-Com FREE. TCP-Com allows any of the existing serial (RS232) ports on your PC to interface directly to a TCP/IP network. File-Wedge FREE. FileWedge parses, filters and formats file data from any disk file before inputting it into other applications either as keystrokes or by DDE. Log data to disk using WinWedge Pro or ComFile then use FileWedge to feed the data into an application later. TCP-File FREE. [Limited Time Offer]. TCPFile allows you to easily log TCP/IP data from any number of TCP/IP ports directly to disk files. Com-File FREE. [Limited Time Offer]. ComFile allows you to easily log RS232 Serial data from up to 16 serial ports directly to disk files. Number of COM ports supported Simultaneously. Data Transfer as Keystroke messages to any other application program. Advanced data parsing, filtering and formatting of any type or structure of data - even very sophisticated data. Basic Keystroke Macro Insertion. Add an additional keystroke such as Enter or Tab at the end of your serial data. Advanced Keystroke Macro Insertion. Add additional keystrokes or keystroke macros before, after, or within your serial input data. Keystroke macros allow you to control where and how serial data appears in the target application program in Keystroke Mode. Fully Selectable Communications Parameters. 110-19,200 baud; 5,6,7 or 8 data bits; 1 or 2 stop bits; EVEN, ODD, MARK, SPACE or NO parity. Hardware and Software Flow Control. Selectable input and output buffer sizes from 128 bytes to 32K. Support for new high speed 16550 UARTs and all available IRQs. A Pre-Input translation table lets you translate or remove specific incoming characters before being received or processed by the Wedge. This greatly enhances the parsing and filtering capabilities. Support for, and translation of, Binary, Hex or Octal data. (All versions support ASCII data). Powerful Math and String Functions. 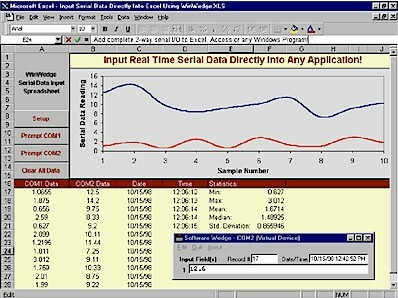 Apply standard and many advanced math functions to incoming serial data. Optional "Hot Key" control of all WinWedge functions. Define up to 50 Hot Keys to transmit prompts at the press of a key. An expanded set of DDE commands giving you more precise control over all serial I/O functions directly from within your other Windows application programs. A Disk File Logging Mode allows data to be collected to a file in the background while another program is in the foreground. Powerful Data Formatting Functions enable you to format incoming serial data before passing it on to another program. Custom tailor your data so that it will be in the exact format required by the receiving application. Place a "Serial Output Buffer" directly in any application that supports DDE. For example turn a cell in a spreadsheet into a serial output buffer so anything you type in that cell would be sent out through the serial port to your device. Long files names, true pre-emptive multitasking and other 32 bit features plus over 30% faster than 16 bit versions. Add a delay between keystrokes sent from WinWedge to other programs.